Geotimes  April 2005  What Makes Good Climates Go Bad? What Makes Good Climates Go Bad? While playing tennis one sunny afternoon, I began wondering the following: What is it that makes good climates go bad? That random question passing through my mind sparked another question: What does it mean to have a good climate? So, I resorted to a Google search on the phrase good climate. In fact the search identified many Web sites with good climate in their text. However, the climate they were referring to almost totally was the atmosphere for carrying out a good business arrangement  a good climate for studying, working and conducting wide range of activities. But climate specifically is the appropriate environment that allows for the carrying out of favored activities. What constitutes good climate is different to people in different places. Some people are acclimated to the cold Arctic. Others prefer the hot humid rainforest, such as the jungles in the Peruvian Amazon. 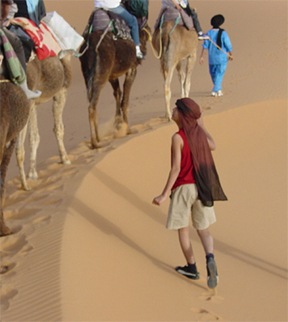 Yet others may live in hot, dry desert climates, like the nomad shown here traveling along sand dunes of the Sahara Desert, near Erfoud in southern Morocco. Copyright of AGI. Eskimos live in cold climate conditions; desert nomads live in hot dry climates; people in tropical rainforests live in what many people in other ecosystems would call oppressive humidity and sweltering heat. These populations in their respective climate regimes may consider their environments to be good climate, but each is very different. And most likely, it would not be possible to encourage any group to move to the others climate setting. American longshoreman-philosopher Eric Hoffer wrote in his 1963 book Ordeal of Change about how people fear change. Our grandparents lived through harsh winters and hot summers, usually without the benefits of heat or air conditioning. They just did it. Today, we have milder winters and not-so-bad summers. We also have all the accoutrements of an affluent industrialized society. We wouldnt think of moving to a home in Arizona with no air conditioning or to a cabin in Maine with no heat. Anything that changes our daily climates would likely cause or will be perceived as a problem because it would mean we would eventually have to change our behavior in ways we dont really know. So arguably, perceptible changes are general examples of a climate going bad. Less rain or more rain for crops, depending on location, activities and crop type, could also signal a climate going bad, as could cloudier days, sunnier days, drier days or more humid days for someone or some activity. What, then, is a bad climate? It is one in which individuals and ecosystems, including human settlements, are unable to survive in a sustainable way over a long period of time. While some individuals may have the fortitude and economic well-being to move to a more favorable climate, most people do not have that option. They have to live under the climate regime into which they were born. To them, the idea of a good climate or a bad climate is irrelevant. They live in a tolerable climate, one to which their expectations and their behavior have become accustomed. While we can question what it means to have a good, bad or tolerable climate, there are real characteristics of a climate that can be measured  temperature, precipitation, humidity, etc.  and matched to appropriate human activities. Those characteristics can change at different rates in different locations. Whether or not humans can adjust to those rates and changes without disruption will vary from place to place, and from time to time, even in the same place. The notion of adaptation has now crept into discussions in the past two and a half decades about global warming (and before then, a decade of talk about global cooling). At first, discussions centered at the international level on prevention of those factors that are enhancing the naturally occurring greenhouse effect. Given the apparent inability of the international community to work together to freeze the global climate regime the way it is today (which, by the way, is favorable to some, unfavorable to others and only tolerable to yet others), adaptation became the buzz word. Prevention versus adaptation frames societal responses as being only black and white, positive or negative, all or nothing. There are other types of societal responses, the ones that individuals and societies engage in all the time, so simple as to be overlooked: adjustment, acclimatization, becoming accustomed to. In thinking about our potential responses, however, it is also useful to think about what shapes our climate. There are many geophysical reasons  including Earths orbit, solar activity, continental drift and volcanism  why good climates go bad. Such reasons seem to get the lions share of the publics attention. But perhaps societies and their leaders are all too eager to blame something or someone else for the damages (death, sickness, misery and destruction) caused by those anomalies. Human activities from a local to a national scale can affect the climate regimes under which people operate. For example, scientists have identified human influences on the climate and weather of metropolitan areas. They have labeled the results of this influence as the urban heat island effect: The concrete and asphalt surfaces that dominate metropolitan areas, along with the widespread use of fossil fuels (coal, oil, natural gas), as well as innumerable heating and cooling systems in high concentration, has led to the heating up of an invisible bubble of warm air that encompasses urban areas. This example shows people altering the climate in the place where they have chosen to settle. In addition, the heat island can also influence precipitation within the bubble, with storms, for example, dropping more moisture on metropolitan areas. The heat island also has impacts downwind in suburban and rural areas, apparently by increasing precipitation in those areas. Human activities have also led to major changes in regional climate regimes. One example of the foreseeability of such an impact can be found in the Amazon basin of South America. Deforestation rates in the basin are quite high, and cutting down the forest reduces, at an admittedly incremental but cumulative pace, the rainforests effectiveness as a sink for atmospheric carbon dioxide. Burning the rainforest creates a source of carbon dioxide as well. Of more immediate concern, though, is that researchers have found that about half of the rain that falls in the Amazon basin comes from the rainforest itself in a self-perpetuating water recycling process. Cutting down trees in the forest chips away at the amount of precipitation that can be expected to fall within the basin. This process eventually reduces soil moisture, river-flow quantity and quality, and even human habitability in the region in ways that can already be seen around the globe on small scales. 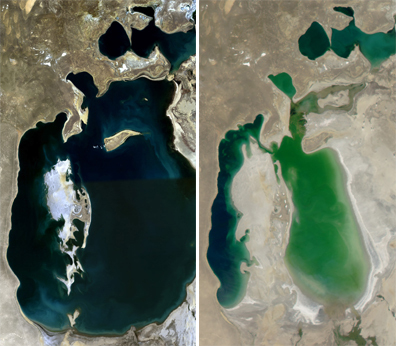 Another example of regional climate change induced as a result of human activities is the changing Aral Sea in Central Asia. The Aral Sea was the fourth largest inland sea in the world as of 1960. Today, it has dropped more than 22 meters and has separated into two separate seas. Its demise is directly attributable to political decisions to divert water from the basins two major rivers that feed the sea, and to put that river water on dry but potentially fertile desert soils. Studies now show that as a result of the desiccation of the Aral Sea and the resulting increase in exposure of large expanses of the sandy seabed (a change in land surface reflectivity), the regions winters have gotten colder and the summers hotter. Once the fourth largest lake on Earth, the Aral Sea moderated Central Asias continental climate and supported a productive fishing industry. It has shrunk dramatically over the past few decades, as people have diverted the primary rivers that fed the sea for cotton farming and other agriculture. Landsat satellite imagery (left image) shows that the northern and southern half of the sea had already become virtually separated by 1989. The image at right was captured by the Moderate Resolution Imaging Spectroradiometer on the Aqua satellite on Aug. 12, 2003, and shows the rapid retreat of the seas southern half, now separated into western and eastern portions. Courtesy of NASA and the University of Maryland Global Land Cover Facility. Books have been written about how civilizations have misused their land by deforesting, over-cultivating, over-irrigating or overgrazing vulnerable ecosystems. North Africa, for example, was once the granary of the Roman Empire. Some historians blame the current desert landscape along the southern Mediterranean on deforestation and on poor land-use practices for cultivation. Others blame it on a major natural change to the regions climate regime. Most likely, both were contributing factors  but in what proportion? There is also a general belief  some say blind faith  that what people have done that is bad for the environment or climate, they can undo. All it will take is engineering know-how and technological innovation. As a result, throughout history there have been attempts to restore changed climate conditions to their original state. Climate modification schemes have been proposed to bring rainfall, for example, back to arid lands where it had once fallen. The planting of trees has been a popular idea, fostered by European foresters to bring rain back. Others have hypothesized that rainfall tends to follow the plow, for example, responding to cultivation practices, as well as tree planting and settlements. That brings us to the topic of the day (or topic of the century)  global warming. I do believe that the byproduct of human activities can alter the chemistry of Earths atmosphere in ways that will slowly but profoundly affect societies worldwide. The emission of greenhouse gases (carbon dioxide, nitrous oxide, methane and various types of CFCs) to the atmosphere in ever increasing amounts since the onset of the Industrial Revolution in the mid-1700s has enhanced the naturally occurring greenhouse effect. The consequence has been the warming up of the global average temperature by 0.7 degrees Celsius since the beginning of the 1900s. While there is controversy over various scientific aspects of the global warming phenomenon (is it human-induced or is it a natural occurrence? ), evidence has been mounting over the past several decades that human activities are at play in the heating up of the relatively thin atmosphere that shrouds planet Earth. But societal leaders and citizens are always on a slippery slope, living within the bounds of the climate conditions that they have inherited from their predecessors as well as having to anticipate future variations. Those leaders have to make decisions about future demands as well as present-day needs for water, energy, food, public health and safety. They are constantly forced to do so in the absence of full knowledge of future climate conditions in other locations as well as their own. We know that climate varies naturally on a range of time scales from months to years, decades, centuries and millennia. We need to understand the causes and effects of those extremes (highs and lows) in variability of temperature and rainfall; we need to juggle their activities against recurrent but aperiodic droughts, floods, severe storms and fires, and against quasi-periodic episodes of El Niño and La Niña. However, armed only with hazy insights into the future and scientific information with varying degrees of uncertainty, we end up tracking the climate variability curves and twists imperfectly. As a result, actions are often taken that prove to have been inappropriate for any particular unexpected climate anomaly. Much of this is known. At least at a general level, we are familiar with the natural factors that affect the planets atmospheric composition and behavior  our climate. We are also becoming increasingly familiar with the actions that societies take that harm the environment, including the chemistry of the atmosphere, thereby affecting climate. What seems to have been neglected is what constitutes a good, bad or tolerable climate. When we talk of climate change, is it that we fear change  any change  to the local or global climate conditions to which we have become accustomed? Or, on a more positive note, is it that we (from Inuit in the Arctic to Tuareg in the Sahara) consider the climate we have as a good climate worthy of preservation for as long as possible? To what extent do societal climate preferences match individual climate preferences? These are important questions to address, as we now know for sure that climates are constantly changing in both linear and nonlinear ways and that over the course of life on Earth, organisms have either adjusted to those changes or perished. Glantz is a senior scientist at the National Center for Atmospheric Research in Boulder, Colo. E-mail: glantz@ucar.edu.